It’s as if laptop makers have started playing a little game of hide-the-webcam. In their zeal to offer borderless displays the built-in webcam gets relocated to the most unfortunate places, often with terrible consequences. This trend started in 2015 with Dell’s XPS. While the InfinityEdge display was lovely, it forced them to move the webcam from the usual location in the top edge of the display. In their wisdom, Dell put it in the “chin” under the display, and even under the logo. It’s literally right above the keyboard. This location makes for some odd viewing angles. It’s been referred to as the “Nosecam,” which seems appropriate. Others have more specific observations here, here and here. Tom’s Guide even suggests you use a trick to rotate the webcam video and place the laptop on its side when making video calls. I believe that the XPS was unique in the respect…until now. Today I read that the Huawei Matebook X Pro (not yet available) has another attempt and innovative webcam placement. Gizmodo writer Sam Rutherford notes that this laptop incorporates the webcam into one of the function keys. 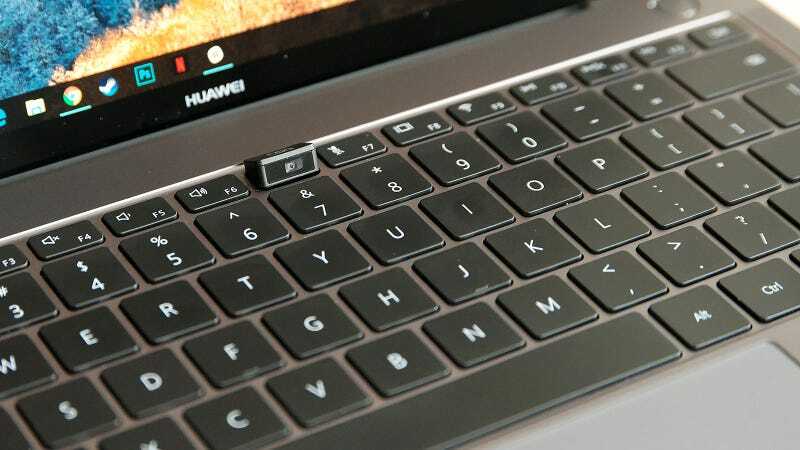 Looking at the image, the webcam is not one of the traditional F-keys. It’s a dedicated key (kinda) inserted between the F6 and F7 keys. At least this design provides a built-in privacy shield. When the webcam key is tipped down the webcam is effectively in private mode. Sadly, it’s still only capable of 1280 x 720 pixels. If you use a webcam routinely, these oddball camera placements are a compelling reason to buy an external webcam. An external webcam, like the Logitech C922 at just $65, simply delivers better video under various lighting conditions. You probably don’t need the C922X which includes a license for Chromacam background replacement software. Save the $20 difference and invest it in a mini-tripod. This will let you position your webcam a little away from the laptop, making it easier to get a nicely framed shot. It also leaves the laptop more available for use while on your video call. Deep down I wish that someone would figure out how to embed the webcam into the middle of the display. That’s a big part of the magic of the DVE Telepresence products. By looking through the display you can maintain perfect eye contact with the other participants on the call.